Hello! I hope everyone is having a great Tuesday. The weather here is freezing and super windy again, our power went out again last night and I was really worried it was going to be repeat of a couple weeks ago but thankfully it came back on after 5 minutes. 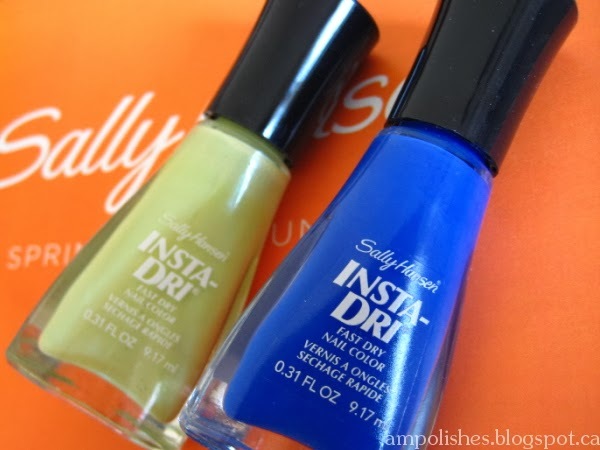 Today I have 2 new shades from the Sally Hansen Insta-Dri collection coming out next month. 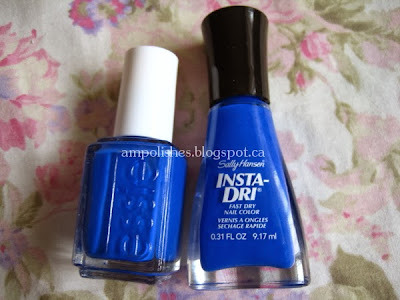 I own a couple insta-dri polishes in my collection and I'm a big fan. I like that it provides opacity in one coat (most of the time), dries very quickly and stamps fairly well. I'm indifferent about the wide brush though, personally I'd prefer a smaller brush and go back and apply carefully with a few more strokes rather than try and apply colour to the entire nail with one stroke. 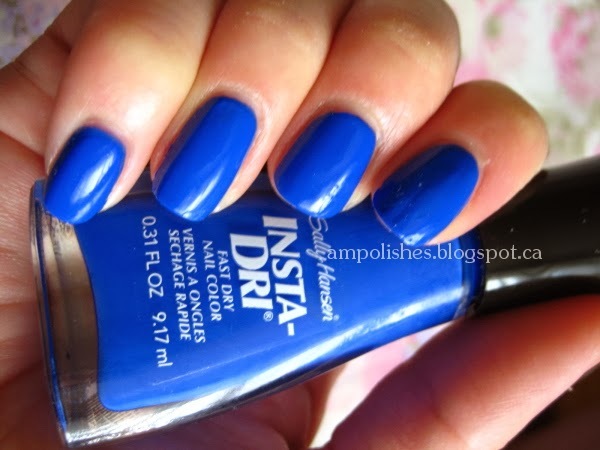 The only other real issue I've had with the Insta-Dri polishes were that they became goop quicker compared to other polishes. I think this is due to it's thicker consistency. 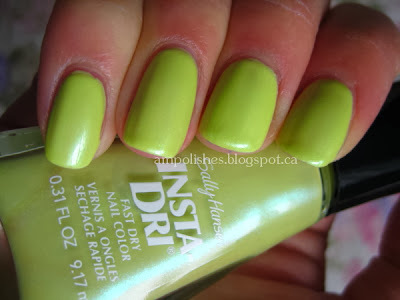 Click to see swatches of Chartreuse Chase and In Prompt Blue in comparison to Essie Butler Please. 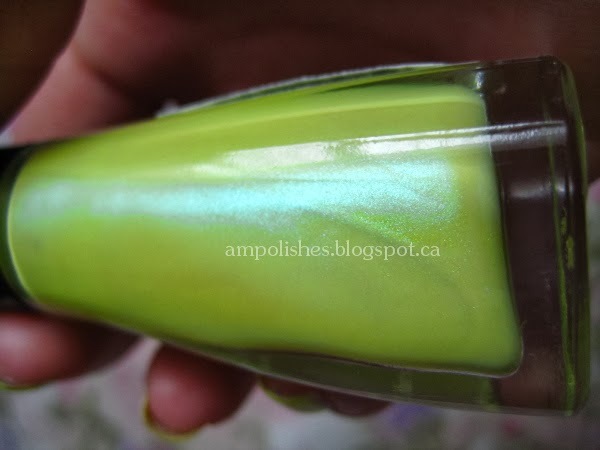 Chartreuse Chase is a light chartreuse green polish with a green shimmer. I used two layers to achieve opacity. The shimmer wasn't very noticeable indoors, under direct sunlight it was more pronounced. Typically this would not be a colour I'd pick right away but I'm glad I did get to try something different because in the end I really liked this shade. 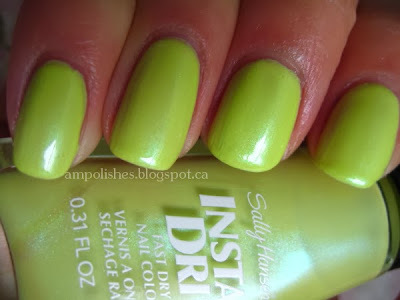 I think it would be a great colour to use for stamping as well! 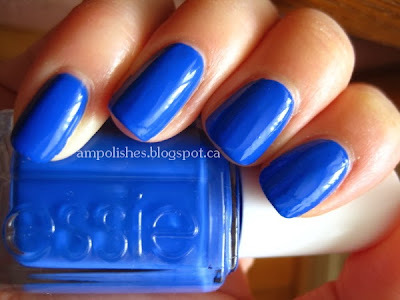 In Prompt Blue is a vibrant cobalt blue, rich in colour, a beautiful creme polish. When I first laid eyes on the polish I thought the colour was very similar to a colour I've seen before. 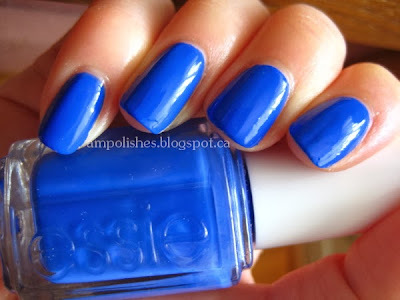 I went to get my Essie Butler Please and low-and-behold they were an exact dupe in the bottle. In the swatches below In Prompt Blue was on my pointer and ring fingers and Butler Please was on my middle and pinky finger, I could not tell a difference at all. In Prompt Blue is a great dupe for Butler Please and much more economical! I used two layers of Butler Please and one layer of In Prompt Blue to achieve opacity. 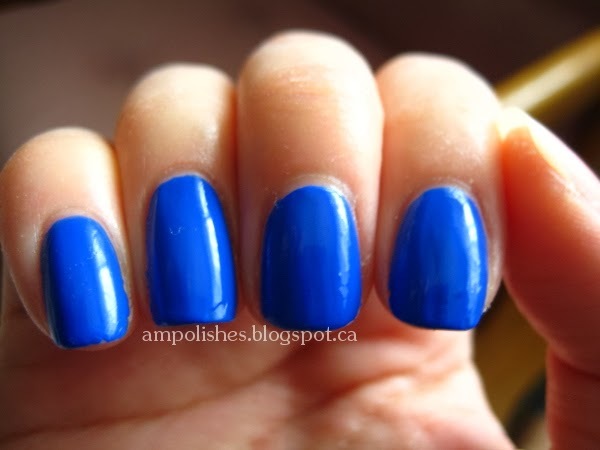 I ended up loving both of these colours but In Prompt Blue impressed me more. The formula and colour was really great and it was an exact dupe of a more expensive brand. If Butler Please has been on your wishlist and you haven't bought it yet due to the price I would recommend picking up In Prompt Blue instead, you won't regret it. Each polish is 0.31 fl oz / 9.17 ml in size and priced at $4.95 MSRP. The collection contains 8 new shades and will be released February 2014 and will be available in most drugs stores across Canada.